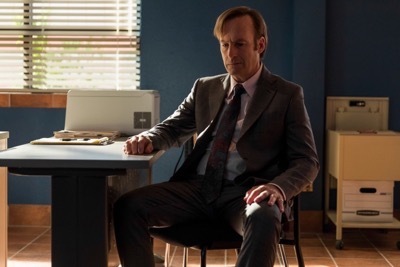 It’s time for Season three of the continuing story on how public defender Jimmy McGill (Bob Odenkirk) became everyone’s favorite selfish and devious lawyer Saul Goodman. 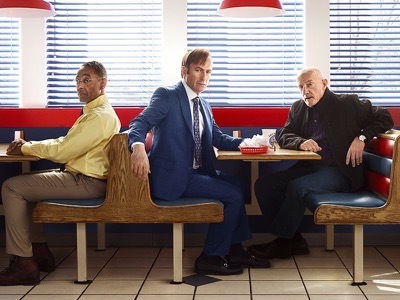 This show has become so much more than a Breaking Bad prequel and does a fine job of standing on its own with compelling stories and a stellar cast. Before once again jumping into the past, we start off with the present (in non- traditional B&W) as we visit our post-Saul who now goes by “Gene” at the Cinnabon he’s been working at in Omaha, Nebraska. Unlike the previous installments we’re given a longer segment this time and it has Gene on his lunch break where he sees a kid shoplifter trying to hide from the local mall police. The cops ask Gene if he’s seen the kid and he points out his hiding spot. Even though it seemed he was hesitant to help out in the end he still cooperated and the kid is apprehended. For whatever reason Gene seems to feel remorse as he watches the kid get taken away and yells at him to “Get a lawyer!” Maybe this is the good guy of Jimmy showing himself after being dormant under wraps for so long. Either way we shift back to the past (now in color!) and start right off when Jimmy leaves his brother Chuck (Michael McKean) after Jimmy has just confessed to altering papers that led to Chuck losing the Mesa Verde account. Unfortunately he isn’t aware of Chuck’s trickery that he was recording the conversation. To what end he hopes to use it against Jimmy we don’t know as later on he plays it for Howard Hamlin (Patrick Fabian) and Howard explains it would be almost useless in court. But Chuck just smiles and says he can think of a way. Of course, true to good writing, the scene cuts and we’re left in the dark on whatever plan they come up with. There’s a little bit of a tease when Chuck tricks his helper Ernesto (Brandon K. Hampton) to play the tape by putting batteries in the player. He tells Ernesto to disregard what he’s heard and act like it never happened but the sly grin on his face afterwards definitely eludes to this being part of his plan. As much as the betrayal obviously hurt Chuck we are given one scene that takes place right after the “recording scene” where Jimmy helps Chuck take down all the mylar off the walls covering the inside of the house. Chuck shows Jimmy how to carefully take it off the like an instructional video. Although brief, it’s a touching familial moment where the older brother is helping out his sibling. Trying to take it one step further Jimmy finds a book named “Mabel” from their childhood that he says their Mom used to read to him but Chuck points out he was the one who read it. As Jimmy continues to go down memory lane Chuck cuts him off and reminds him of the conversation they had earlier and states he will pay for it. So much for any more of that brotherly love happening. This show is all about the transformation of a man so it’s always important to have those moments where we can point out where we can see him changing. Enter Captain Bauer (Brendan Fehr) who was the man that Jimmy lied to in order to shoot a scene for his commercial on a military base. 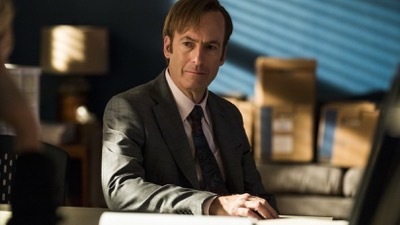 Bauer confronts Jimmy at his office when he has seen the commercial and realized he was duped. He tells Jimmy to take the commercial down or he will turn him in. To which Jimmy jumps on the offensive and explains how he will bring up how Bauer was the one to let him on the base to shoot and what kind of negative consequences that could have on HIS career. We see how Jimmy goes from the apologetic to the vicious to get what he wants. He has worked hard to try to build his career and he will not let someone come in and take him down for something that no one even got hurt in the process of. He has no problem sacrificing Bauer’s feeling of pride and shame in the name of coming out on top and keeping the commercial that he put together. 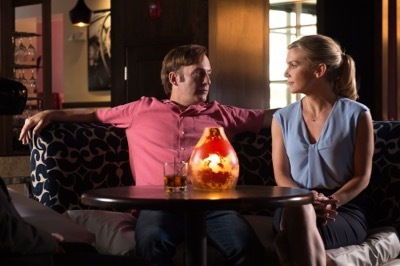 Providing another example of Jimmy’s soul falling off as Saul will grow in its place. Finally we get to the best part of the episode (as he often is) with Mike (Jonathan Banks) finding that note on his car and deducing that someone is watching him. 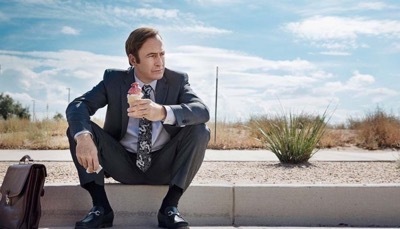 He quickly takes it to a junkyard and in a sequence that is so synonymous with the Vince Gilligan style tears apart the car in a sped up fashion trying to find a homing bug. Finally after he had thought of everything he comes up with finding it in the gas cap. He figures that if there was one in that car there is probably one in his other as well (he is correct) and proceeds to also take out that one. Now using a bunch of tech science that I will admit took me twice to watch (oh stop chuckling) he drains the battery of the ‘bug” and uses it as a trap to lure the person out that planted it. He plants his own bug he purchased in the gas cap so that he can track the person that comes and takes it. I swear with the “face that says 1000 words” Johnathan Banks could have a silent film based on just this character and it would be amazing. The minimal dialogue that comes out of such an expressive face but can hold our attention with no problem is a rare talent and this man should be praised every episode for it. Can’t wait to see where this car he’s following leads to!! 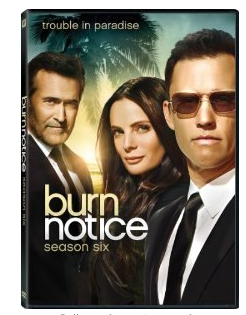 Burn Notice Season 6 DVD Review! 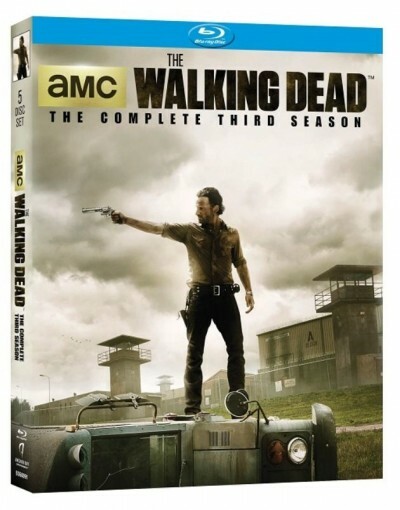 Erica Says Check Out The Penultimate Season Of The Bruce Campbell Hit! The Oranges Blu-Ray DVD Review! Did The Hugh Laurie Film Have Enough Juice?!? Catherine Keener! Allison Janney! And More! 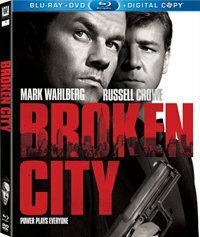 Broken City Blu-Ray DVD Movie Review! Mark Wahlberg & Russell Crowe Square Off In This Tense Political Thriller!